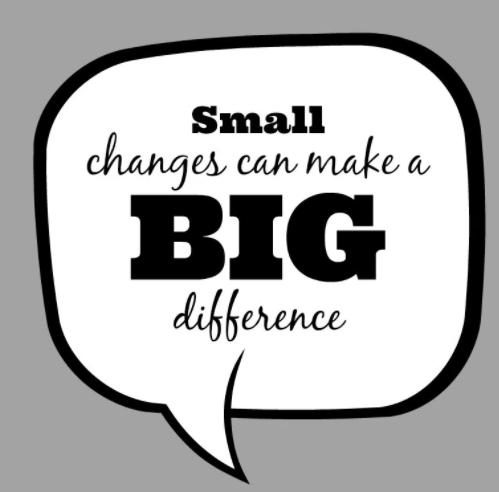 Change is hard, especially if they are habits and behaviours that are your default, that make you feel good, that you have been resorting to for a long time. But it is possible to change and it is possible to do it without the feeling of sacrifice and it is possible to make change last and become your new normal. The most common trait that we see in clients is the desire to want to shake everything up simultaneously to quite an extreme degree. Clients decide the time for change is now and they want to go hell bent at it, crash dieting and unsustainable exercise regimes are what they are looking for. The problem is that it can’t last, and even if they reach their dream weight loss or fitness they are unable to sustain it. Why? Because no one, can train alone or with a Brighton personal trainer maximally every day, be on a hugely restrictive calorie intake, hold down a fulltime job and be a functioning member of society. So what happens? They fall off the wagon, they have not spent time building up a strategy to pick themselves up when this happens and they simply drift back into their old habits. What happens then? We usually see them walk back into the Brighton fitness studio a year or two later, looking more unfit than they had the first time and much more unhappy. How to not be this client? Understand that you are human, that you will fall off the wagon and that you need to spend time building your recovery strategies into the working out and weight loss program. Once that is clear in your mind you have bought yourself some leeway, you need to decide how you are going to treat yourself when things go wrong and you miss a personal training session or eat a cake. A good way to do this is to say “OK I recognise that wasn’t part of my plan, I am going to drink a pint of water/ brush my teeth and go do something positive now like cook a healthy meal/take the dog out for a long walk” Call it a mental re-set, and this will give you a sense of control rather than a sense of urgency before you loose the motivation to attack this wellness goal and you slip back into your old ways. How should you attack the training/eating plan from here? Easy; bit by bit. Just choose one thing to focus on food wise and one thing to focus on training wise. For example let’s say you are eating really late and drinking while waiting for dinner and with dinner and its building into a nightly routine that you feel is your down fall. Try making your food goal to be making sure you eat before 7pm every night and not drinking on weekday evenings. Let’s say you feel you don’t exercise enough, your one training goal could be to exercise once on the weekend and once in the week alone, with a Brighton personal trainer or as part of a group exercise class. After you have fully mastered these changes then, and only then move onto the next two changes. Your food change next could be to ensure you eat the right macronutrients and your next exercise change could be to add another weekly workout to your program. After that becomes habit you could add your next two changes, and so on and so on….until there are no more changes left to make! And continually with the knowledge that you have a fall back plan everytime you fall off the wagon.